Crab meat can be a healthy addition to any diet. 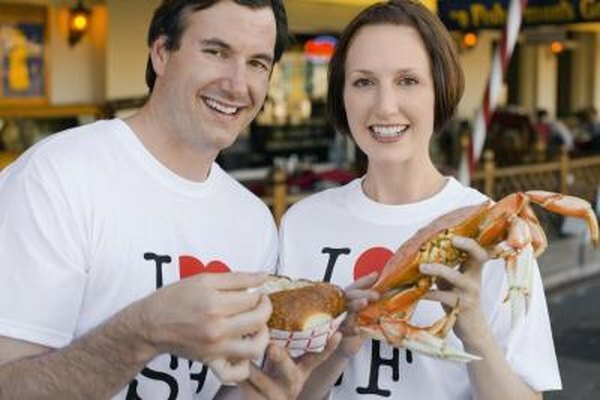 Fresh whole crabs or crab legs may be available in your store’s seafood section. Alaskan king crab legs are usually available frozen. Fresh lump crab meat is available in some specialty markets, but canned crab is widely available alongside canned sardines and tuna fish. A lean source of protein, crab meat also provides more than a dozen essential vitamins and minerals. Crab meat provides multiple essential nutrients. It is particularly rich in vitamin B-12, which, along with the other B vitamins, helps to convert food into energy. Vitamin B-12 also helps nerve cell function and regulates red blood cell development. Alaskan king crab, Dungeness and queen crab all provide more than 150 percent of the recommended dietary allowance for this nutrient. Crab meat also provides more than 20 percent of the RDA for phosphorus, essential to strong bones, and 40 percent of the trace mineral selenium, which acts as an antioxidant and helps with thyroid function and immunity. Crab also provides about 7 percent of the RDA for vitamin B-6, 8 percent for calcium and at least 40 percent for zinc and 30 percent for copper. Canned crab meat contains only 7 percent of the RDA for B-12. Three ounces of crab meat provides between 16 and 20 grams of protein, toward the 46 grams women need each day. Protein is an essential macronutrient that helps you maintain muscle and create cells. Protein can also help you feel full and rev your metabolism, according to the Harvard School of Public Health. Crab meat is low in calories, containing between 85 and 95 calories per 3-ounce serving and depending on the variety. It contains just 1 gram of fat in 3 ounces and has no carbohydrates. Compare this to other indulgent protein sources, such as beef tenderloin, which contains 185 calories per 3-ounce serving with 11 grams of fat. The mild flavor of crab is also a benefit because it can be used for many different preparations. Crab meat may be used to top green salads. Mix canned or fresh crab with non-fat yogurt, lemon juice and celery to make a healthy sandwich filling. Use crab meat cooked with cumin and chili powder as an alternative to white fish in fish tacos. Crab meat can be added to frittatas or omelets or used in lieu of Canadian bacon in eggs Benedict. Crab meat on its own is low in calories and fat, but it is often included in more indulgent preparations. Crab cakes, made with bread crumbs, eggs and mayonnaise and then fried, are not the healthiest way to enjoy crab. Crab dips with cheese, sour cream and mayonnaise or pasta dishes with cream sauces and crab are other dishes to avoid. Some forms of crab contain significant amounts of sodium. Alaskan king crab has 911 milligrams per 3-ounce serving and queen crab contains more than 500 milligrams per 3-ounce serving. Canned blue crab and Dungeness contain about 330 milligrams per 3-ounce serving. The Institute of Medicine recommends keeping sodium intake below 1,500 milligrams daily. What Is the Difference Between Vitamin D Milk & 1% Milk?